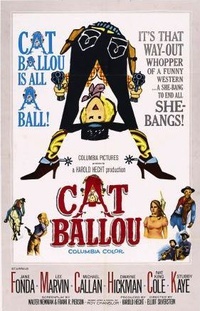 Cat Ballou is a 1965 comedy/Western film, the story of a woman who hires a notorious gunman to protect her father's ranch, and later to avenge his murder, but finds that the gunman is not what she expected. The movie stars Jane Fonda in the title role, with Lee Marvin, who won an Oscar for his dual role, Michael Callan, Dwayne Hickman, and singers Nat King Cole and Stubby Kaye, who together perform the movie's theme song. The film was directed by Elliot Silverstein from a screenplay by Walter Newman and Frank Pierson from the novel The Ballad of Cat Ballou by Roy Chanslor. Chanslor's novel was a serious Western, and though it was turned into a comedy for the movie, the filmmakers retained some darker elements. The film references many classic Western films, notably Shane. This webpage uses material from the Wikipedia article "Cat_Ballou" and is licensed under the GNU Free Documentation License. Reality TV World is not responsible for any errors or omissions the Wikipedia article may contain.